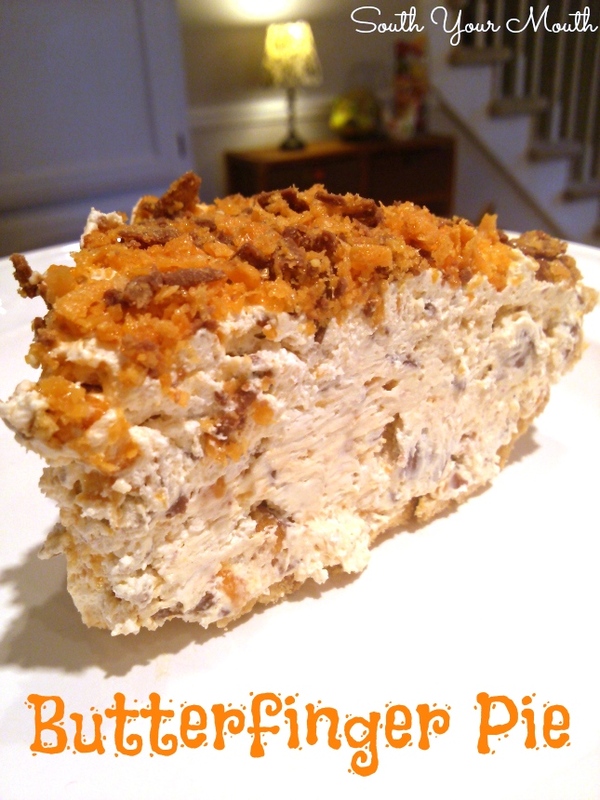 Original Butterfinger Pie recipe with Butterfinger candy bars, cream cheese, vanilla and whipped cream topping. Sometimes I feel a little sketchy posting recipes as easy as this because I pride myself on having a knack at recipe development. But y’all. This one is too good not to share. It’s light and fluffy and rich and decadent at the same time. And it’s crazy easy. I have no idea who to credit as the original recipe source for this because it’s everywhere. Like, everywhere. I tried to drill down to a source but this one’s like six degrees of Kevin Bacon. Errybody can lay a claim to it. The only thing I did different than the others is to add a little vanilla to the filling. I've seen recipes for both 8 and 12 ounces of Cool Whip. I went with 12 because I like a big fluffy pie and I was afraid it would be too rich with just 8 ounces. But use what you have or what you prefer – either seems to work. 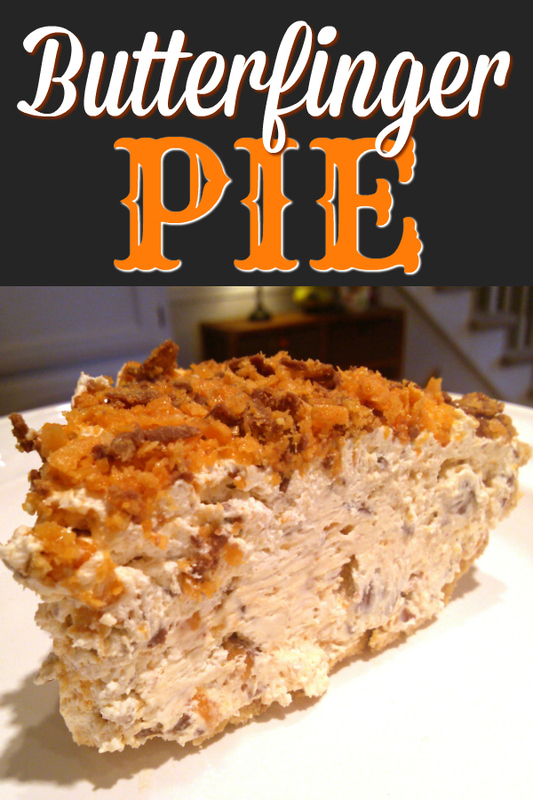 Chop Butterfingers into small bits and set aside, reserving 1/2 cup to sprinkle on top of the pie. I've done this a few ways over the years and have found the best way is to just line them up on a cutting board and chop with a chef’s knife. Using a food processor or smashing with a mallet or rolling pin tends to cream the chocolate a bit and things start to clump together. Fold in crushed Butterfingers and remaining Cool Whip then mix by hand until evenly combined. Spoon mixture into pie crust. Sprinkle reserved 1/2 cup of crushed Butterfingers over pie. Cover and refrigerate for 2 hours before serving. Store in refrigerator. *Use any size of Butterfinger candy bars (snack sized, fun sized or standard) so long as you have about 14 ounces total. AH.MA.ZING! Fabulous too. Love the ease of the recipe. Thanks so much for sharing at Weekend Potluck! Pinning this one for summertime! I've made this several times and it is WONDERFUL! Pretty easy too. 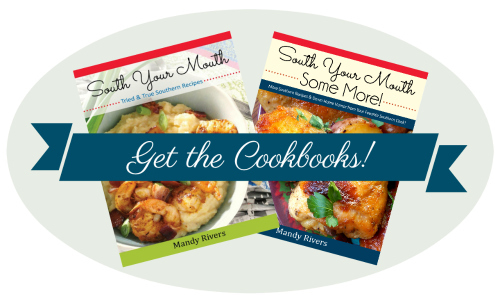 A good introduction to cooking for the kids. Do you think real whipped cream would work just as well? (I just don't like Cool whip) Thanks! Can you make this the day before, or will it get mushy overnight? Sounds wonderful, try it this week !